Contact us by telephone or email to see how quickly a cost-effective website could be earning your business money. Our offers include lots but especially your ideas, your graphic designs, page headers, sub-sections, your sales pitch and pictures. All this can cost as little as €130 (BREXIT £ prices call us). Our customers just love the care and attention we offer to help build a stunning website and help them cash in on the 24/7 advertising power of the web. It’s not just about the techie bits – we’re good at that – but actually just as cruicial, the whole concept of where your business wants to be and how we can help you get there. Your business could probably be doing so much more! It pays to advertise 24/7. Call Chris Davison on the number below to chat through the possibilities. A current project undertaken by Chris Davison Consultants is to offer advice, support and management to an exciting Anglo-German collaboration. 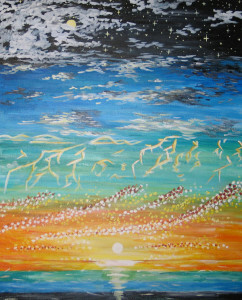 Bracknell Forest in S.E. 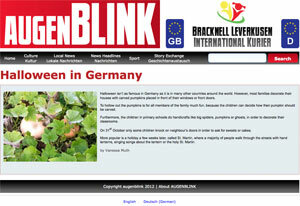 England and Leverkusen in North Rhein Westphalia have been twinned for over 45 years but it is only recently that young people in both communities have been taking part in an online, dual-language magazine joint venture entitled ‘Augenblink’. Chris speaks German and supports high-level links with colleagues in education and the wider community in Germany and UK. Managed by Chris Davison Consultants on behalf of The South East Grid for Learning. The BirdBox project brings together the best of online live video broadcasting over broadband with curriculum support to encourage teachers and their pupils to engage in learning about nature at first hand. The SEGfL bird box project provides schools with an opportunity to share video and data streams collected from nesting boxes fitted with video cameras and other data gathering equipment. 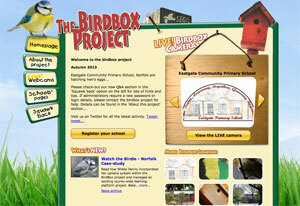 Schools across the UK and Europe are able to view nest box activity and share in interactive events. Details are to be found on the birdbox website which is added to daily during the nesting season. BirdBox website design and technical management by ‘gooii’ Ltd.